If you look up at the sky on a clear night you can see stars, lots of stars. Astronomical recordings from observatories let you see them in much greater detail. The Dr. Remeis Observatory in Bamberg, which belongs to Friedrich-Alexander-Universität Erlangen-Nürnberg, owns approximately 40,000 historical photographic plates, a genuine treasure trove for anyone interested in stargazing. 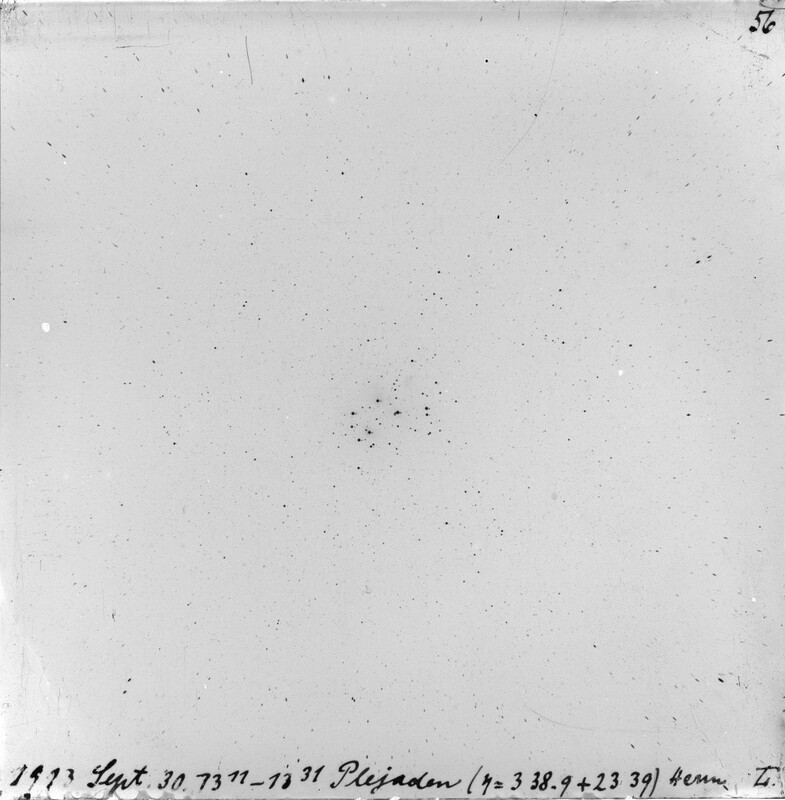 Together with Leibniz-Institut für Astrophysik Potsdam and the Universities of Hamburg and Tartu (Estonia), astronomers at FAU have now digitalised roughly 70,000 such glass plates and published them online at www.plate-archive.org. The project is being funded by the German Research Foundation (DFG). Astronomers have been using photography to research planets, stars, galaxies and other astronomical objects for more than 150 years now. Telescopes or large-scale cameras were fitted out with glass plates coated with light-sensitive emulsions even as long ago as the end of the 19th century. These photographic plates had very long exposure times – often one hour or more. The first digital devices emerged in the late 1980s and have now almost entirely replaced traditional photographic plates. However, the glass plates are a very reliable storage medium, with lifetimes of more than 100 years. Today, more than 400,000 photographic plates are stored in the archives of German observatories, accounting for approximately one quarter of all the photographic plates that exist in the whole of Europe. They are not only valuable from a historical point of view, they are still highly significant for research even today, as astronomers can use them to track the movements and changes in brightness of stars over several decades. In addition, modern digitalisation techniques and software can be used to answer a whole range of new questions, allowing astronomers to investigate millions of stars much more objectively and accurately. For example, research can be carried out into activity cycles of stars, similar to the eleven-year cycle of the sun. However, all this potential knowledge cannot be taken advantage of unless people are actually aware that such an image exists, and know when and how it was taken. This is exactly what the APPLAUSE database delivers – together with the image itself. A sizeable catalogue of over 70,000 digitalised photographic plates from the four observatories mentioned above is now available online, covering the years 1893 to 1998. Each individual scan is several hundred megapixels in size. The largest plates that measure 30×40 centimetres can be more than one billion pixels. For the web archive, information on more than 3.5 billion positions and magnitudes of stars, minor planets and galaxies were extracted from the plates and identified by being compared to modern astronomical catalogues. First of all, the scientists allocated the celestial coordinates to the scanned plates with the help of specially designed software. The software compares the objects on the scans of each photographic plate with known constellations and calibrates the brightness of the objects influenced by the coating of the plates. This step allows the data to be compared with other catalogues. In addition, the team also transcribed and digitally recorded the observatory notes and log books by hand. Thanks to this information, the historical data can be used for academic studies and environmental parameters, such as air temperature and quality of observation, can be taken into consideration when assessing the data. At the same time, the scans of the observation logs illustrate how astronomers worked in the past century, making them of interest to historians. The 22,000 photographic plates which have been digitalised to date at the Astronomical Institute at FAU in Bamberg are special. They are photographs taken between 1963 and 1976 by researchers observing the southern skies from observatories in South Africa, New Zealand and Argentina. The images they recorded are unique, as theirs was the only astronomical project to document the southern sky in the 1960s. By March next year the FAU astronomers hope to finish scanning the remaining photographic plates in the observatory’s archives which show the northern sky between 1926 and 1939. By the end of 2019, researchers in Postdam ought to have completed their work on processing and incorporating the data into the database.